On almost the third anniversary of establishing this website I now look back at my hopes and aspirations at that time. 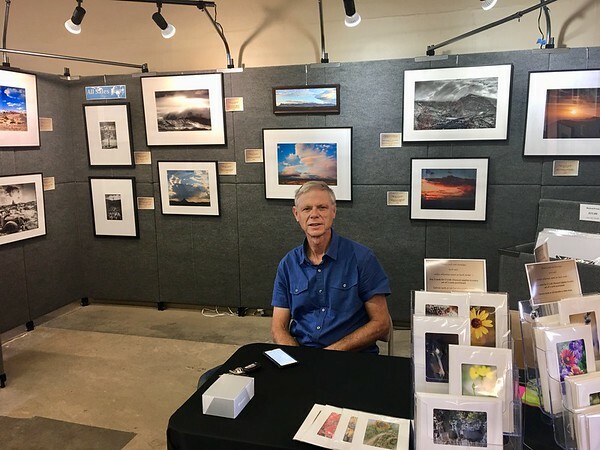 Of course we have the firm conviction that our work is wonderful and no one could resist buying: Over three years only one customer in Georgetown, Texas has purchased a couple of Big Bend photos. I don't count pitying family and friends, only strangers who have no other motive than actually liking the image(s). However, that is really OK by me. I honestly don't need the income at this point and although there's a shopping cart, I use that to order my own products mostly as gifts.I am MOST pleased that anyone would come here and just appreciate the digital version of what my eyes have seen as worthy of being shared with the world at large. I only wish the process of dropping a comment were less encumbered. 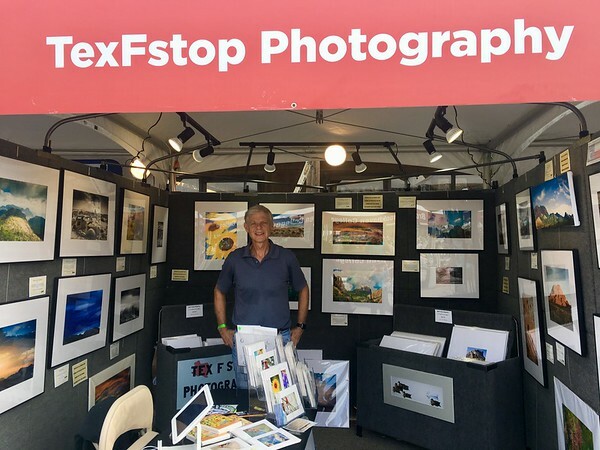 At the various events where I have actually found buyers for my photography, I have noticed that a word of praise as a long-lingerer leaves the booth to be more gratifying to me than "ker-ching." I guess I've found that having that personal interaction with customers is the best part of selling; it seems that when someone actually has a framed or matted work in hand it is more likely to sell. You see the actual result, exactly what you're buying. Who knows what a lab may send out to you, really? Buying a hard copy is more certain. So to make myself feel better about my dismal performance here, I keep in mind the many sales at the fairs or what have you. If I handed you my card, then, it's really just so you can enjoy some of my images on your computer or mobile device. As a matter of fact, there are many pictures here that I'd never prepare to sell "live" at an event. They're just there for you to see, sort of educational, perhaps. This might be a song sparrow scratching around in the dead leaves looking for a meal. Hang that on the wall? I myself would not. When I look at stats and see "x" number of views, it's a rush for me...so please keep looking! The photograph above I refer to by different titles. I'll call it Morning Sun, Chisos Mountains. 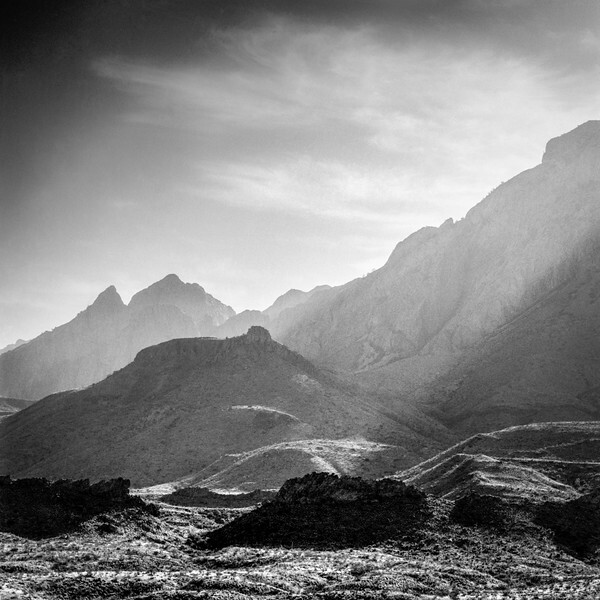 I took it around three decades ago on my first journey to Big Bend National Park for photo-taking purpose. I believe I took along maybe eight rolls of Kodak Verichrome Pan 125 ASA film, or, around 100 exposures available to me. That's quite different from our digital opportunities to click the button! The camera was a good ol' Hasselblad 500 CM. I managed to get to this spot on the northwest corner of the mountains and found the sun spotlighting some hills on the desert. Well, thirty years later I've added film back to my repertoire including having a darkroom, of necessity. How great to print this old negative for the first time in so many years! Unfortunately, time has seemed to take its toll. You can see the story here. 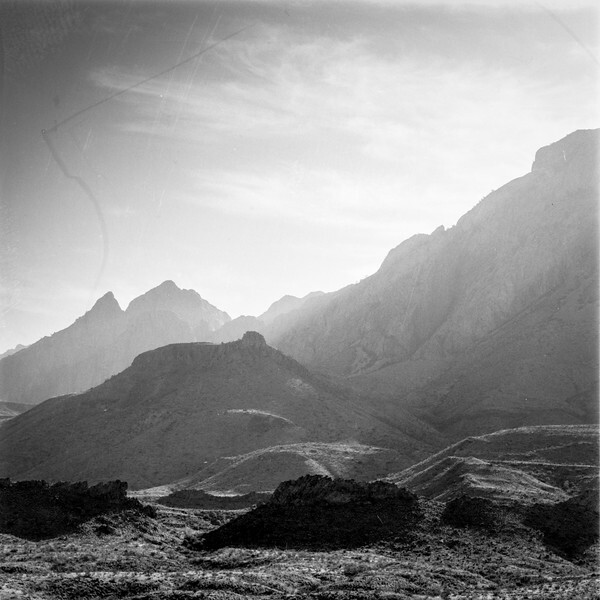 Efforts to print on silver gelatin paper gave something like this. So, enter the scanner. Digital to the rescue. The image cleaned up nicely. I call this "estuary" because like salt meeting fresh water in a unique biome, so here the ancient craft of analog film was given new life by the modern digital art of the sensor. 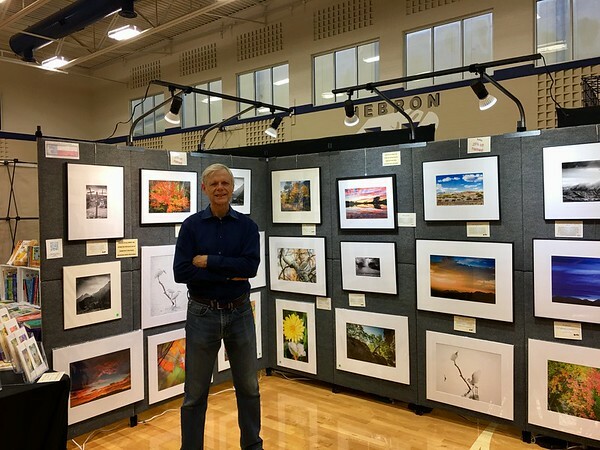 This photo got a good reception last fall at an event in my hometown of Carrollton, Texas. A matted copy did sell, all those years after the original "capture." The smart phone, though having a small sensor, is growing in terms of quality as a tool for photographic documentation or even expression. The fact that it's just about...ok always...with us makes it quite the go-to gadget. Yesterday evening I was driving home from picking up some dinner when I began to notice a developing scene to the west. The sun was at first in quite a tangle of clouds with some orange to it, OK, but not spectacular. As I was leaving the food establishment, I was shocked as to the transition in the sky even after sunset. Even after I finished making the captures and I was going on towards home, the reds became deeper and more vibrant. So, I found a safe place to park where the pavement dead-ended into a field the developer's plow has yet to raze. Knowing that I wouldn't be satisfied with the "panorama" taken with that setting in the phone, I took six overlapping verticals. Going home, I merged these together in Adobe Lightroom Classic (I think it's now called?) There were no edits at all. I just created the panorama from the separate captures. It's a 7.4mB file, respectable enough to make a decent sized print. I really didn't mind all the human elements at the bottom of the frame; they added to the power of the image by displaying how puny man and his works are at the feet of the awesome creation. Lesson learned, of course. 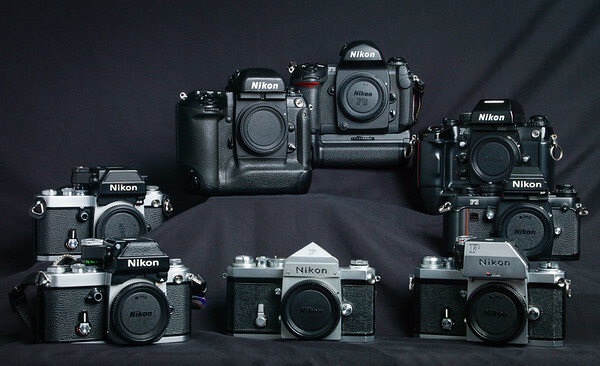 Take your Nikon or Canon out with you when you go, as you never know what will unfold that's art worthy. But, if caught with your SD cards down, grab the phone and use it intelligently! In violation of rule 1. I still liked the backlighting! Lately, I've begun to give more time to photographing birds. Most of that pursuit takes place, ironically, in an area where I used to shoot the mourning dove when I was a boy. Now the place along Furneaux Creek in Carrollton is grown up with nice homes overlooking the small spring-fed lakes where my father and I would use a .410 gauge shotgun to harvest bull frogs from the shores of said lakes. A nice lady named Teresa stopped me the other day, her attention being drawn to my apparent expertise in the field of avian captures by the presence of my Nikon 200 -500 zoom lens hanging down from the camera which was attached to the strap that was encircling my poor neck. She said she had found it challenging to take photos. I'm not sure if she was referring to birds or just to general photography, but for the sake of this subject, lets say it was birds. 1. Employ the old rule about the sun over your shoulders. Try to get front lighting or side lighting. 2. Avoid shooting from the rear; show the "face." 3. Shoot on manual exposure mode. This avoids unpleasant surprises like when a flying bird suddenly crosses a dark background. Your auto exposure will read the blackness, make the exposure one which raises that luminance to middle gray, and will thus overexpose your bird, especially if it's a white one. 4. To add to point 3, find a neutral, middle toned area where you're shooting, such as average green foliage. Fill the frame with that, set your shutter speed to either 1/1600 or 1/2000 of a second, set aperture wide open (f5.6 or whatever you have), and shoot this neutral subject. Check your histogram. If nothing in the graph is climbing up either side of the graph, you're OK. Conversely, take along a small 18% gray card and meter off of it. 5. Long lenses are great, but work with what you have. Find a spot and sit quietly waiting for subjects to appear. Scout ahead to find those places. And remember, you don't have to have a frame-filling shot of a bird to make a good photo. Often, the environment it's in will add a lot. 6. This is most important: Work with continuous high capture if your camera does that. My Nikon D500 can shoot 11 frames per second and it's download ability with RAW files is impressive, I believe around 40 captures in queue. Especially for birds in flight, but also for any bird that's perched or afloat, just act like you're filming. You will luck into some great shots this way. 7. An afterthought: If shooting waterfowl swimming, try getting down to eye level with the birds rather than shooting down at them. However, watch carefully where you sit if in a park. Not all people are considerate about the management of their pets' excretions. Shot from the rear, but the face is there. White bird with darker background. Auto metering will overexpose subject. 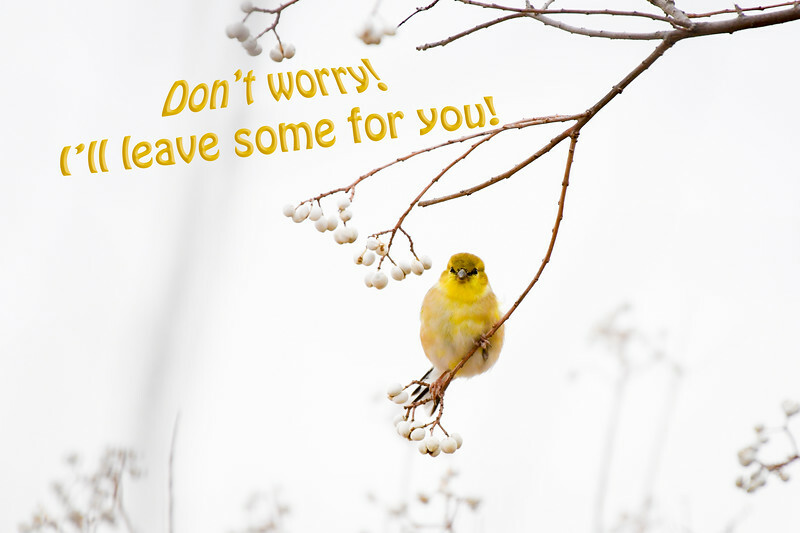 This finch doesn't fill the frame, but tree branches make nice setting. By shooting continuous high, I managed to get these. Rare sight of the ruby on this kinglet! Shooting on CH, I was fortunate to get this. Robin was on ground. I knew he would fly, so CH shooting got this. With the fullest understanding that I'm basically typing to myself...well, it's therapeutic. That inveterate master of black and white film photography, Ansel Adams, at the end of one of his books made the comment that he anticipated the advent of digital photography and intimated that he would embrace it because, "...photography is an all-inclusive medium." Of course it helps to know he was from California...It would have been great to see what he would have done with a Hasselblad H system digital camera. Instead of meticulous film/developer testing and the Zone System to get a negative scaled the way he wanted it, he'd just drag some sliders around like we do today. It's hard to imagine the beauty of the output. So, which is better, film or digital? That is the silly question. And don't think that it's irrelevant! The young bloods out there these days are quite fascinated with a return to film. It may be partially a rebellion against technology-based digital or just a curiosity with how Dad used to do this. Check out that popular video site, searching film photography. For me personally, I'm glad both are there. (I'm glad oils on canvas haven't stopped being produced as well.) With digital, there are a lot of advantages over film. There's the instant review of what has just been taken to check out if it's a good, well-focused, well- exposed picture. There's the second chance in post capture to tweak the exposure, color vibrance, levels, etc., etc. Portrait photography has been greatly helped with all the edits used these days to make the subject look his or her very best. Digital can be shared very easily over the Internet and from a smart phone. It's GREAT for shooting animals like birds in flight because of the high speed continuous way of shooting. And these days, digital is the most direct route to color photography. However, film has its charms as well. There's the tactile aspect, the olfactory, smelling that coated roll of plastic as you take it out of that little canister or tear it out of that smooth packaging. There's the pleasure of opening that camera back or magazine, and having to use your hands to skillfully attach the leader to the take up side and then get to advance to frame 1. It makes you grateful that you can have 36 exposures and you treasure each one. You compose carefully, expose carefully, keep the camera steady. You can't just blast away at a flying bird. You are much more careful than with digital. There's no instant preview, but on the plus side, you don't lower your face to that LCD which might make you actually miss good shots because you have lost connection with the subject. With film you just keep looking and shooting. One that note, one of the BEST parts of no instant preview for me is that feeling of anticipation as you open up the development tank in the darkroom, unwind the negatives from the reel, and get to see how you did. Sometimes, if a roll has been in the camera for a while, you see images you'd altogether forgotten you had taken! Film is physical. A negative is something you actually have to MAKE. The prints can be made very archival and the resolution of film, I've read, would require a 400 MP camera to achieve digitally. So, yes, I shoot both film and digital. I appreciate the qualities of each medium and often hybridize, such as when an important negative has an issue that normal darkroom trickery won't solve. I'll scan the negative and fix in the editing software and print on inkjet or make an inkjet transparency of it to contact print in the darkroom for a traditional silver gelatin or platinum/palladium print. So if you get the chance, enjoy both worlds. Ansel would have! Part of my collection, bought mostly fairly cheap off you-know-where. Taken, to support my thesis here, with a Hasselblad digital camera. Just let me say that the phone call that I received from the Carrollton Parks Department in response to my email to same was pleasant, with an apology for ignorantly removing habitat. 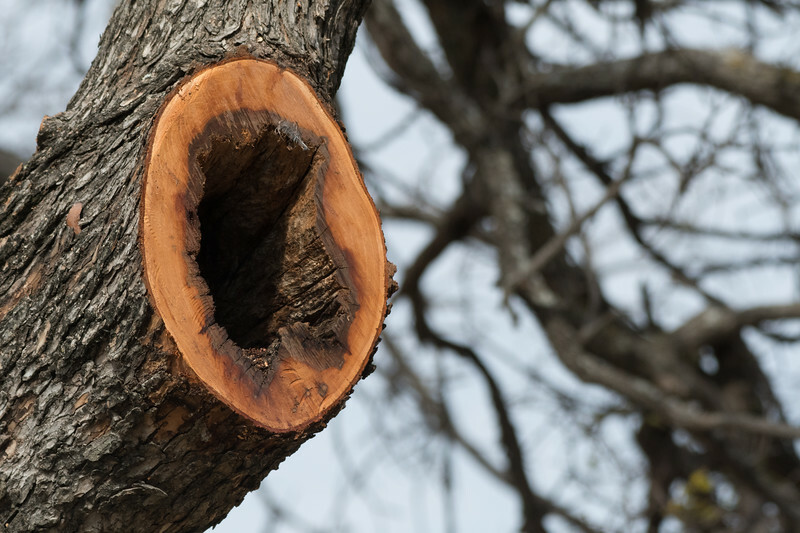 However, when you see a nice hole in a tree, fellows, please think before we have another Texas chainsaw massacre, OK?